Fierce fighting has shaken Mosul in recent days as thousands of US-backed Iraqi soldiers and police battle to reclaim the country's second city. MOSUL: Iraqi forces seized a third of west Mosul and trapped Islamic State group fighters inside as they made further gains in their battle to retake the city, officials said on Sunday. A renewed push against the jihadists launched last Sunday has seen IS forced from several neighbourhoods and key sites, including the main local government headquarters and the famed Mosul museum. By Sunday, Iraqi forces were tightening the noose. "ISIS is trapped. Just last night, the 9th Iraqi army division... cut off the last road out of Mosul," the US envoy to the anti-IS coalition, Brett McGurk, told journalists in Baghdad. "Any of the fighters who are left in Mosul, they're going to die there," he said. "We are very committed to not just defeating them in Mosul, but making sure these guys cannot escape." 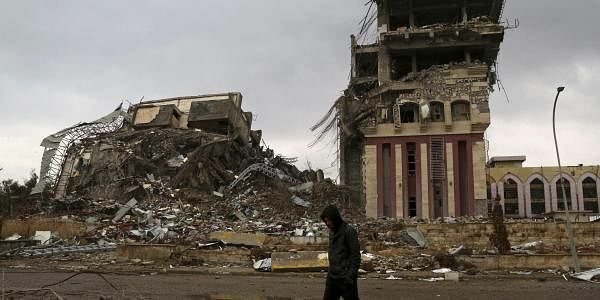 Staff Major General Maan al-Saadi of the elite Counter-Terrorism Service told AFP that "more than a third" of west Mosul was now under the control of security forces. CTS forces were battling IS inside the Mosul al-Jadida and Al-Aghawat areas on Sunday, he said. Iraq's Joint Operations Command (JOC) said that forces from the Rapid Response Division, another special forces unit, and the federal police were also attacking the Bab al-Toub area on the edge of Mosul's Old City. "The battle is not easy... we are fighting an irregular enemy who hides among the citizens and uses tactics of booby-trapping, explosions and suicide bombers, and the operation is taking place with precision to preserve the lives of the citizens," the JOC's spokesman, Brigadier General Yahya Rasool, told AFP. IS resistance "has begun to weaken in a big way", he added. IS seized Mosul in mid-2014 and swept across areas north and west of Baghdad, taking control of swathes of territory and declaring a "caliphate" straddling the border with Syria. Backed by a US-led air strikes and other support, Iraqi forces have since retaken much of the territory they lost. The operation to recapture Mosul -- then the last Iraqi city under IS control -- was launched in October. After recapturing the east of the city, Iraqi forces last month set their sites on the west, where hundreds of thousands of civilians remain trapped. Northwest of Mosul, Iraqi forces on Saturday announced they had uncovered a mass grave containing the remains of hundreds of people executed by IS inside the infamous Badush prison, taken this week. The Hashed al-Shaabi paramilitary forces found "a large mass grave containing the remains of around 500 civilian prisoners in (Badush) prison who were executed by (IS) gangs," the military said. According to Human Rights Watch, IS gunmen executed up to 600 inmates from the prison in June 2014, forcing them to kneel along a nearby ravine and then shooting them with assault rifles. The US-led coalition launched air strikes against IS in Syria and Iraq in 2014 and is providing a range of support to allied forces in both countries. In Syria, the coalition is backing an Arab-Kurdish alliance known as the Syrian Democratic Forces (SDF) that is pushing towards the jihadists' de facto capital Raqa. On Sunday, the SDF fought fierce battles with IS jihadists east of Raqa, around the village of Khas Ajil, the Syrian Observatory for Human Rights said. SDF forces took control of five villages as they continued a slow advance, the monitoring group said, and several coalition air strikes hit the outskirts of Raqa early on Sunday. Turkish-backed rebels are also advancing against IS in northern Syria, as are government troops supported by Russia. The Britain-based Observatory also reported fighting on Sunday in eastern Aleppo province where the jihadists forced regime troops to fall back from the outskirts of the Jarrah military airport. Russian and Syrian strikes hit IS-held areas in the province, Observatory said, with eight civilians, mostly from the same family, killed in a strike on the village of Maskanah. Syria's former Al-Qaeda affiliate Fateh al-Sham Front meanwhile said Sunday it was behind twin bombings targeting Shiite pilgrims in the centre of Damascus that killed 74 people. "On Saturday... a twin attack was carried out by two heroes of Islam... in the centre of the capital Damascus, killing and wounding dozens," a statement said. The Observatory said 43 Iraqi pilgrims were among those killed when a roadside bomb detonated as a bus carrying pilgrims made its way through the Ban al-Saghir area of Damascus's famed Old City and a suicide bomber blew himself up. The attack also killed 11 Syrian civilians and 20 members of pro-government security forces, it said. Shiite shrines have been a frequent target of attack for Sunni extremists of IS and Al-Qaeda during Syria's devastating six-year war.